Home Out Of Office FHP Student Living helps Aegis save lives. FHP Student Living helps Aegis save lives. Nottingham student lettings agent FHP Student Living has added a number of clothing banks to its student developments continuing a successful 7-year partnership with Newark-based charity, the Aegis Trust. In 2017, the Aegis Trust which works to prevent crimes against humanity and mass atrocities worldwide, raised £30,000 through its White Rose clothing stores, using donations from clothes banks across the city. To help meet its target of raising £100k for 2018, FHP Student Living has increased the amount of donation points across the city. FHP Living has hosted a clothing bank at The Arena on Standard Hill for more than six years, and is set to continue with added help from its student arm. Commenting on the plans, Jonty Green Head of FHP Student Living, said: “We wanted to provide the students with a way to recycle unwanted clothing, while supporting a good cause. The clothing banks installed at the developments have been a great way to make a start with this – the clothes donated are often on trend and stylish, so are very good sellers in the stores. 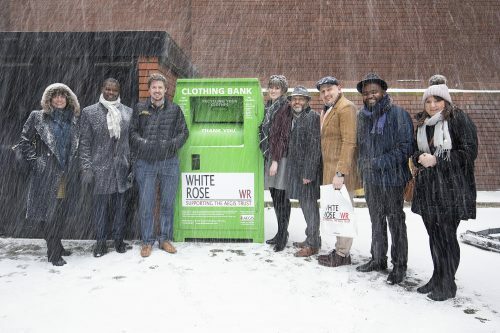 “Each year, the clothing bank at The Arena on Standard Hill has received more than a tonne of clothing donations that are then recycled through White Rose charity shops, generating thousands of pounds for the Aegis Trust each year. White Rose charity stores were set up under the Aegis Trust in 2009 when the initiative was handed to two Nottingham Trent University graduates, as a business opportunity.